Dolly is a Jack Russell terrirer and Spanky is a rescue miniature horse. These best friends love to do shows together in the U.S. and Canada. Photo courtesy of Francesca Carson. There are nearly two billion monthly active users on Facebook who spend at least 20 minutes a day on this prominent social media site. While many connect to their friends, family, colleagues and fellow students, others connect to a variety of four-legged superstars who have their very own pages and their very own followers. Meet crowd favorites Dally, an 8-year-old Jack Russell terrier who rides atop Spanky, a 9-year-old miniature horse. The two are not only sensational performers, they’re the best of friends. Check out the athletic prowess of 5-year-old Bamboo, a mutt who seriously knows how to skateboard and is also practicing his soccer skills. Get to know stylish 7-year-old Crusoe. The miniature black-and-tan dachshund loves to travel, enjoys the limelight and “authors” his own books. Because of their amazing feats, natural abilities and considerable amount of charm, it’s easy to see why these animals are social media stars. Dally and Spanky reside in northeastern Washington state and perform at a variety of events in the United States and Canada. They’ve been working together since 2012, when Spanky was rescued and taken to Horse Creek Ranch. Dally, the unpopular runt of her litter, arrived at the ranch in 2011. The ranch offers a variety of horsemanship and rider development programs. Its setting enhances the bonding experience between humans and horses—on trails, through open pastures and up mountains. And just like with so many human relationships, the love between this dazzling duo grew over time. “For Dally, it was love at first sight. Spanky took a little longer,” says their trainer, Francesca Carson. One day, Dally couldn’t hold back her feelings any longer and just jumped on Spanky’s back—a move that started it all. Now the two jump through hoops, leap over barrels and dive over fences. Sometimes the jumps include triple jumps. “The crowds especially love when Dally runs and leaps onto Spanky’s back and then they go over the jumps together,” explains Francesca. She adds that the performances are followed by Dally’s giving her a high five. The duo puts on several shows per year, and in between the two make appearances for photos and autographs. May 26 to 28, they’ll perform at The Mane Event Horse Expo at WestWorld of Scottsdale in Arizona, and July 14 to 16 at BreyerFest at Kentucky Horse Park in Lexington. They’ve also been on the Late Show with David Letterman, appeared in National Geographic and won the 2016 World Dog Awards. Dally and Spanky have a couple of books out: The Dally and Spanky Coloring Book and, more recently, The Great Adventures of Dally and Spanky: The True Story of a Rescued Miniature Horse and a Jack Russell Puppy. “Both kids and adults love the book’s message that ‘no matter what we look like or how different, we can triumph together,’ ” says Francesca. When they’re not busy training, exercising or “reading” fan mail, Dally and Spanky like to kick back and eat and sleep. “They are like most of us—couch potatoes,” Francesca adds. In addition to Facebook, the show-stopping twosome can be found on YouTube, Twitter and Instagram. Bamboo, from Solana Beach, California, is an impressive skateboarding dog who is also honing his soccer skills and practicing Frisbee. He’s learning many commands—such as “Paw Trap,” to stop the soccer ball by putting his paw on it, and “Push,” to push the skateboard. The rescue mutt was adopted as a puppy by Mike Bolaris and his family, through Labradors and Friends Dog Rescue Group in San Diego. Bamboo is from a litter of nine that were born to a stray in the San Bernardino desert. A DNA test determined he’s part Rhodesian ridgeback and part American Staffordshire terrier. Bamboo was always very eager to learn to do everything that Bolaris and his children could do, so it was fun working with him on spins, twists and other tricks. “Teaching him to skateboard was as easy as just giving him encouragement to do so,” Bolaris says. Bamboo’s stunts and skill sets are featured in a collection of videos on his Facebook page and on his YouTube channel, where he skateboards, practices soccer and performs tricks. “More Bamboo videos are in the works,” adds Bolaris. Although Bamboo has an innate athletic ability and a great stage presence, Bolaris says the dog’s showmanship has to do with practice and spending quality time with him. “All dogs have potential to do amazing things, and all it takes is spending a few minutes a day having fun with your dog,” Bolaris explains. Crusoe just knows when it's acting time and has no problem wearing homemade costumes. Photo courtesy of Lauren and Ryan Beauchesne. Crusoe is a miniature black-and-tan dachshund residing in Quebec, Canada, with “mum and dad” Lauren and Ryan Beauchesne, who got him as a pup. Crusoe’s brother, Oakley, lives with Ryan’s parents. Crusoe was named after none other than Robinson Crusoe—because his love of adventure was noticeable at a young age. Crusoe has always been a celebrity in the making. “I used to take pictures of him as a pup and post them to my personal Facebook,” explains Ryan. People first fell in love with him through those pictures. In addition to having good looks, Crusoe is calm and easygoing, especially for a dachshund—a breed known for high energy. “Anyone who knows dachshunds at all, and then meets Crusoe, is blown away just by how chill he is,” adds Ryan. Such qualities makes Crusoe great to work with, and he just knows when it's acting time and has no problem wearing homemade costumes. These include jungle explorer dog, hunting dog and Mickey Mouse dog. Crusoe’s travels are covered in his second book, due in fall 2018. 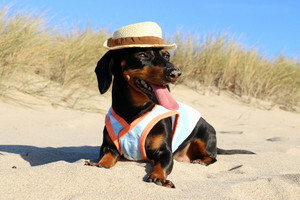 His first book, Adventures of The Wiener Dog Extraordinaire: Crusoe, The Celebrity Dachshund, was a New York Times bestseller, and its release included a book tour across the country. Crusoe also offers a collection of fan items on his website and a percentage of the proceeds help support the Ontario SPCA/Humane Society. Because of the popularity of his wardrobe, he’s coming out with his own costume line. One of Crusoe's videos was recently played by Ellen DeGeneres on her television talk show, thanks to winning the “Ellen DeGeneres' Super Bowl Commercial Challenge.” Crusoe has been nominated for a Shorty Award, which honors the best of social media. And he’s the “spokesdog” for BarkBox, where members are sent a themed collection of toys, treats and a chew every month. Although the dog’s days look brighter all the time, it wasn’t always that way: Crusoe encountered a big challenge last August, when he had emergency back surgery to remove an exploded disc that had gone up against his spinal cord. Crusoe has intervertebral disc disease, which affects about a quarter of dachshunds. After his surgery, the Beauchesnes spent two months teaching him to walk again, stimulating his nerves and building back his strength, “It was a long and hard road, but we are so thankful that he is doing well again now,” says Ryan. The silver lining was they were able to educate many people—especially dachshund owners—about the risk of the disease and what can be done to help prevent it. Crusoe’s full recovery is documented on his website and YouTube channel. “We're hoping 2017 is a healthy year for Crusoe. He's truly our little baby,” Ryan adds. Bini the Bunny. Photo courtesy of Facebook.com/BinTheBunny. Dally and Spanky, Bamboo, and Crusoe are four sensational animals that are becoming more famous by the day. And there are more out there, such as Bini the Bunny, of Los Angeles. 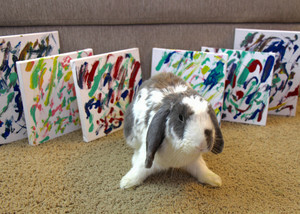 The 4-year-old Holland Lop rabbit plays basketball, combs and styles hair, and enjoys arcade games. But Bini is most famous for creating original paintings! 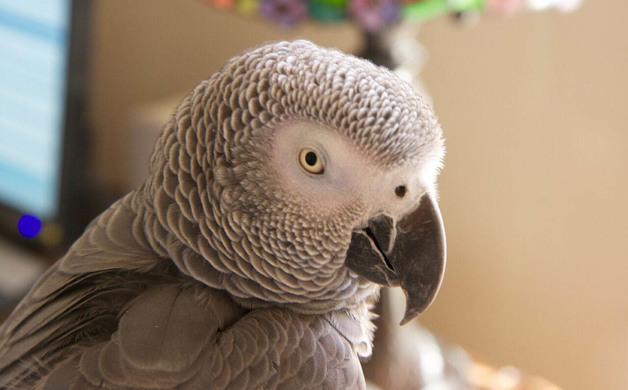 There’s also Einstein, a 20-year-old African grey parrot that lives in Texas. Einstein loves to talk, sing, dance and do impersonations—an especially funny one is of actor Matthew McConaughey. This talking bird clearly says words and phrases, such as “Let’s go eat some dinner” and “Look at you!” His website has links to fan merchandise and the Einstein Parrot Fan Club newsletter. Some proceeds help support parrot rescue groups. And while you can friend and follow these amazing animals on Facebook and other social media, you just might also be inspired to teach your old dog a few new tricks! Photo courtesy of Marcia and Einstein Parrot. Written by Ann Marie O’Phelan, a Southwest Florida resident who is a regular contributor to TOTI Media.